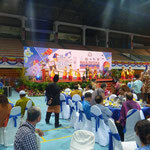 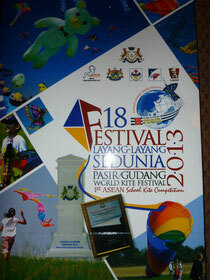 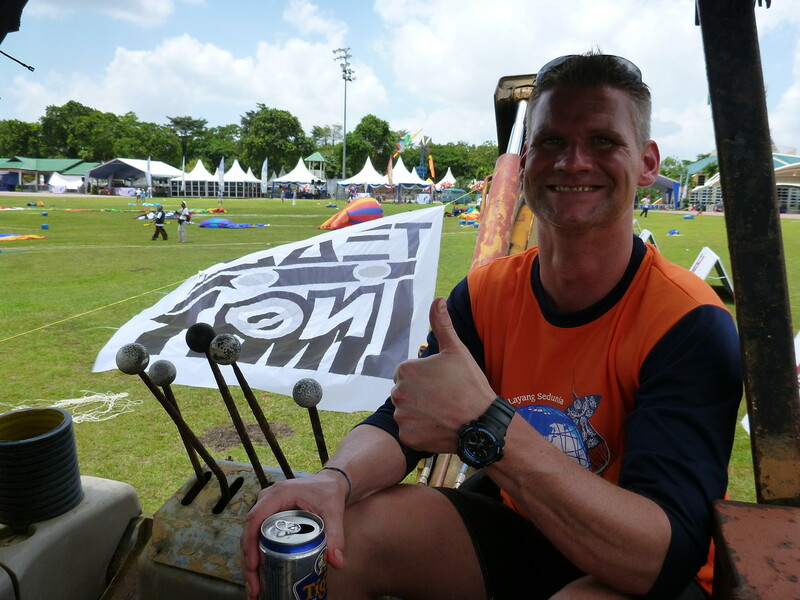 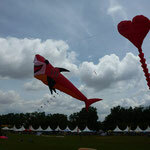 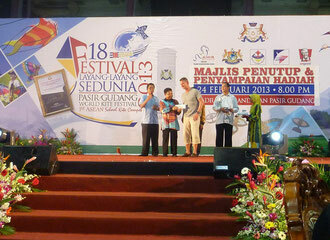 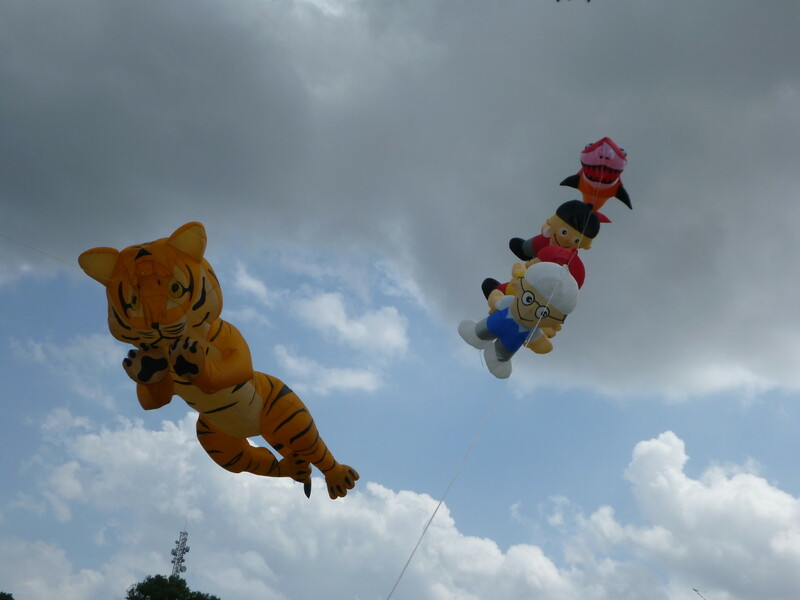 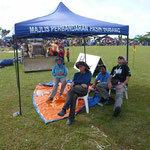 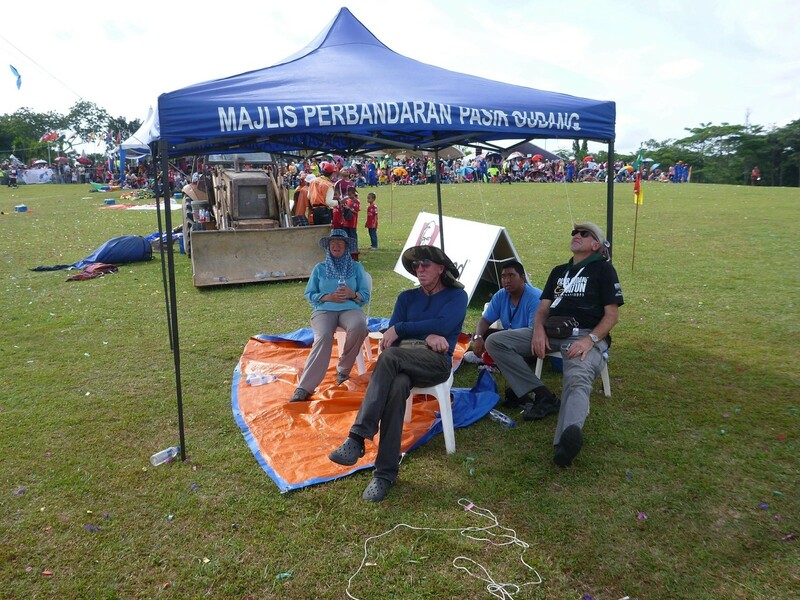 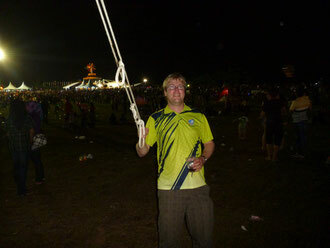 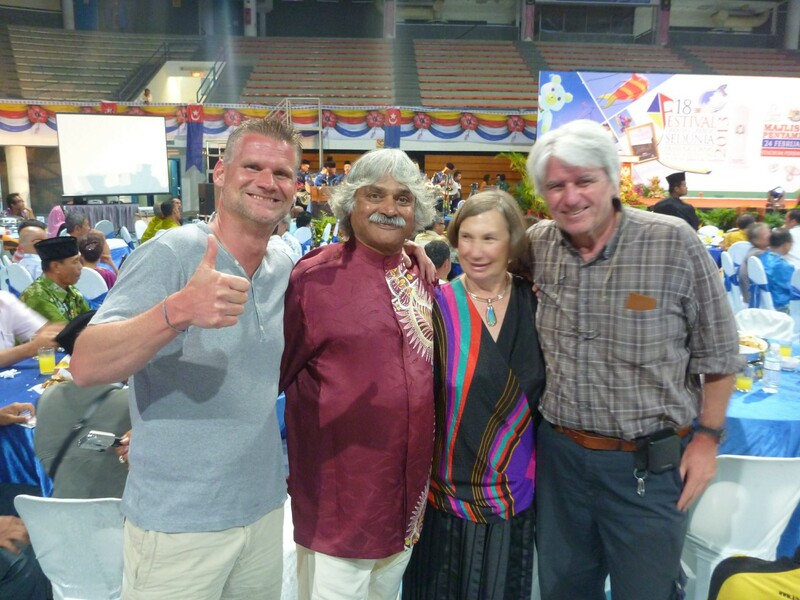 Olli and Volker participated in the 18th Festival Layang Layang Antarabangsa Sedunia Pasir Gudang (Pasir Gudang international Kite Festival). 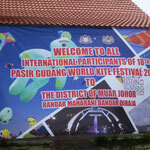 After meeting at Paris Charles de Gaulle, Olli and Volker arrived just in time for the kite fliers briefing in Hotel Selesa in Pasir Gudang. 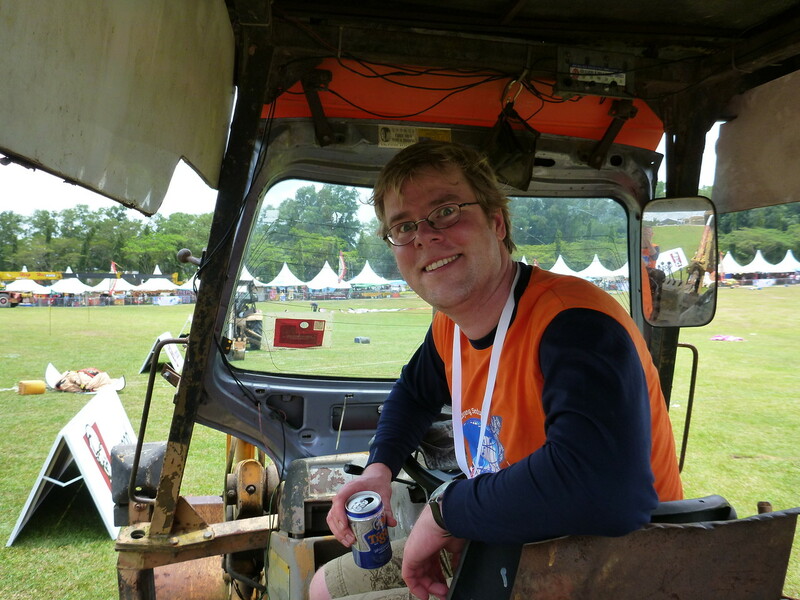 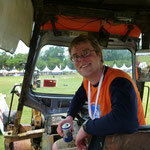 Volker joined this festival in 2003 and most following years, and Olli joined in 2006 already. 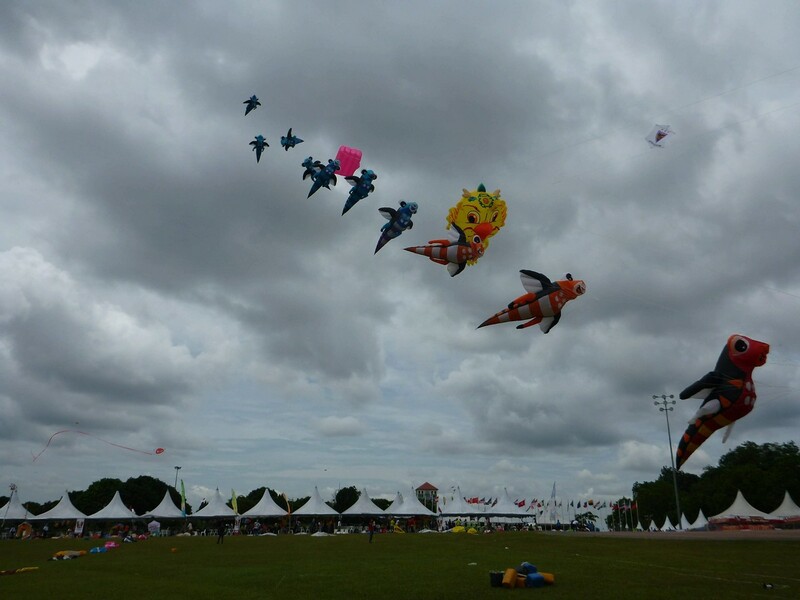 The first flying day was warm as usual, a bit more than 30°C. 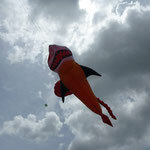 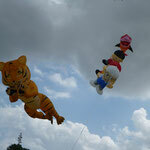 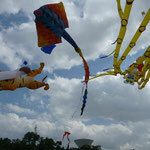 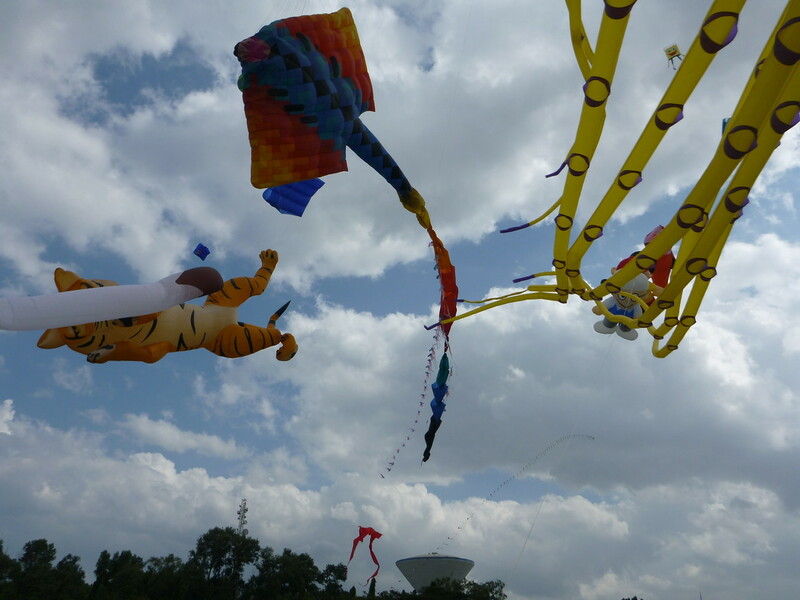 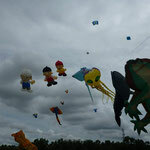 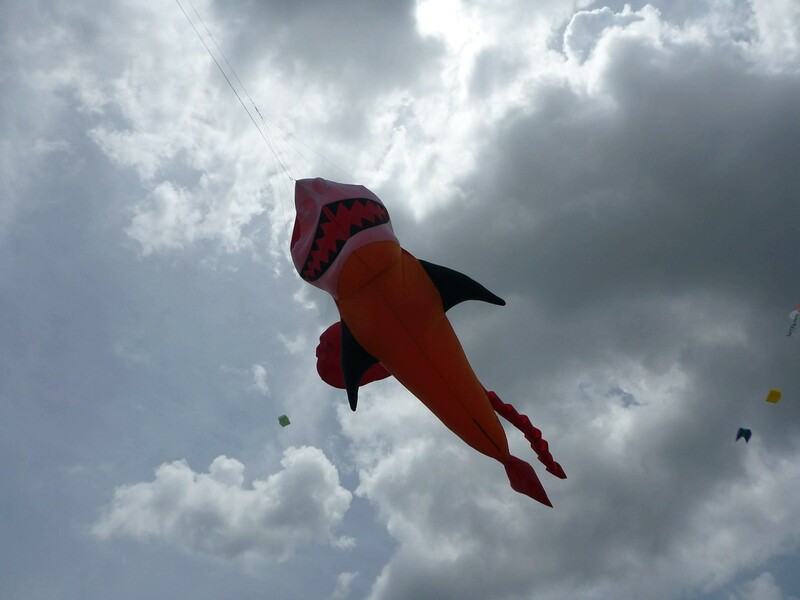 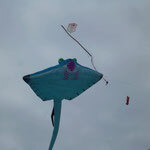 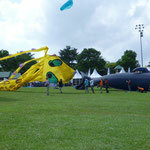 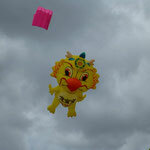 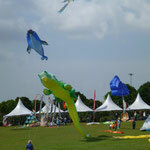 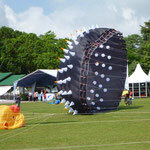 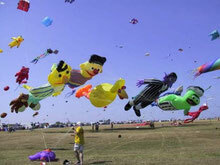 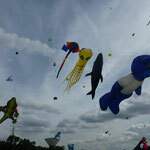 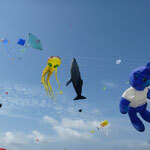 Luckily, there was no rain, and until lunchtime, the kites had more airtime than during the whole festival 2012. 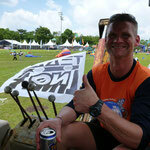 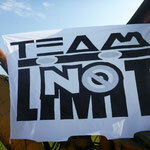 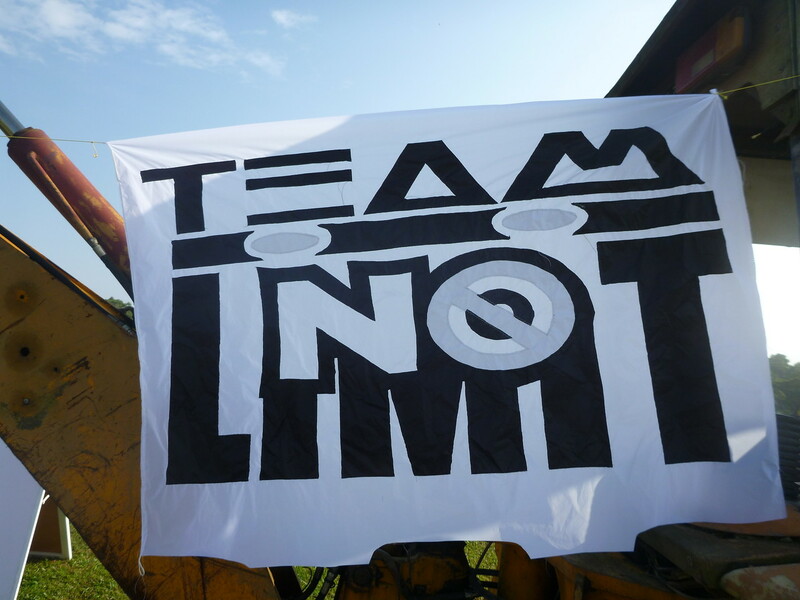 The day continued with better than usual, but still a bit changing winds, supported by the warm suppport of the sun. 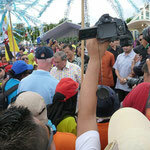 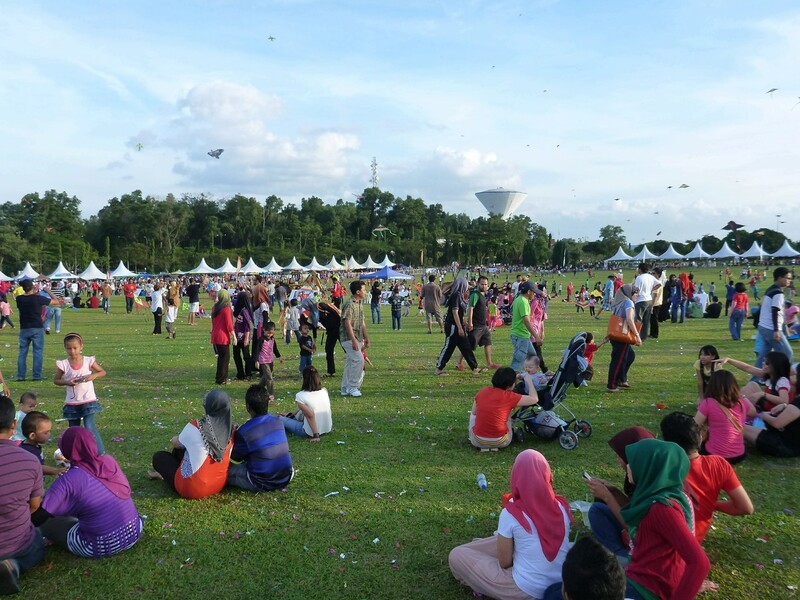 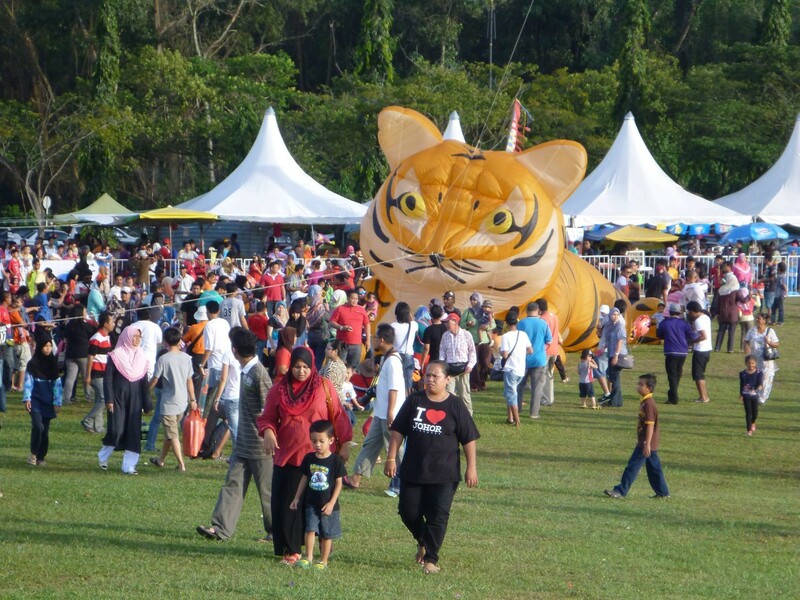 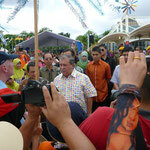 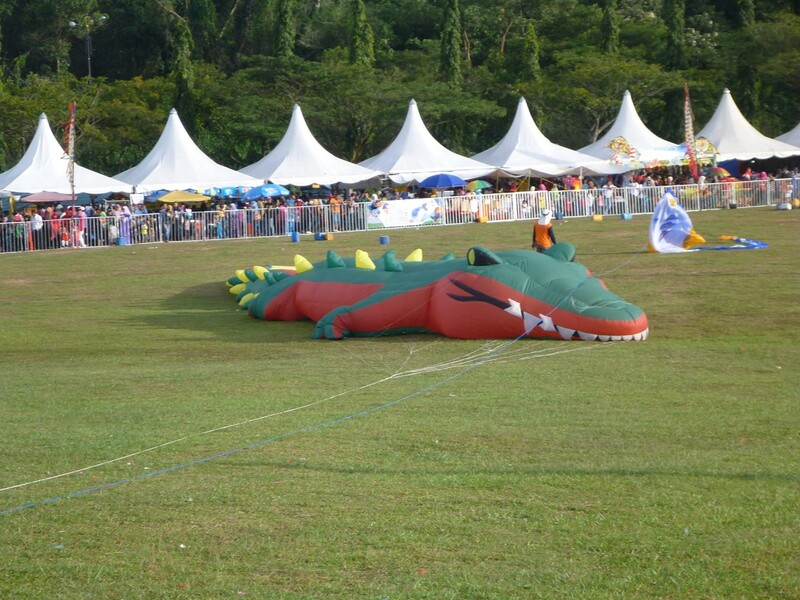 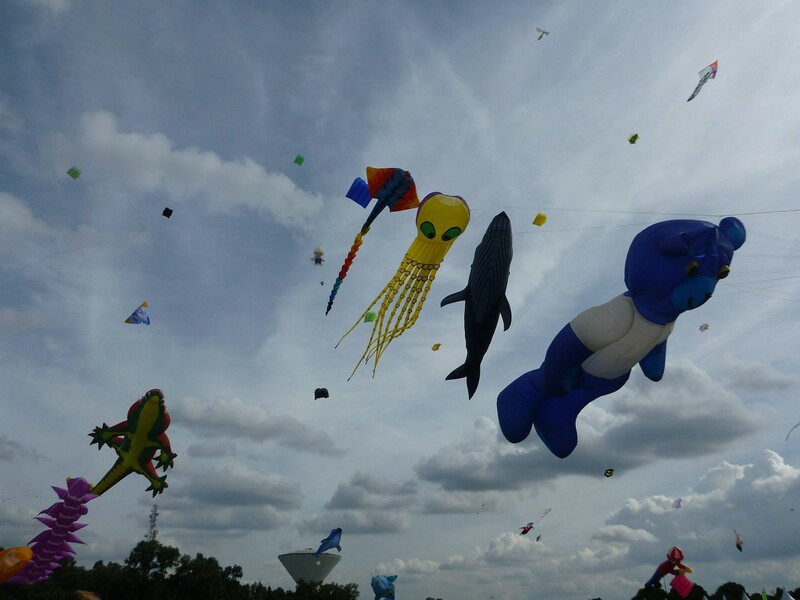 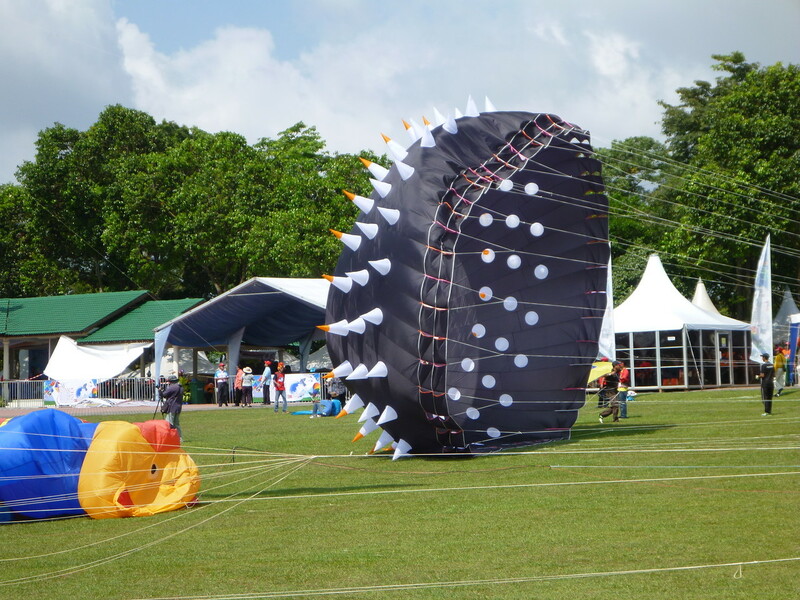 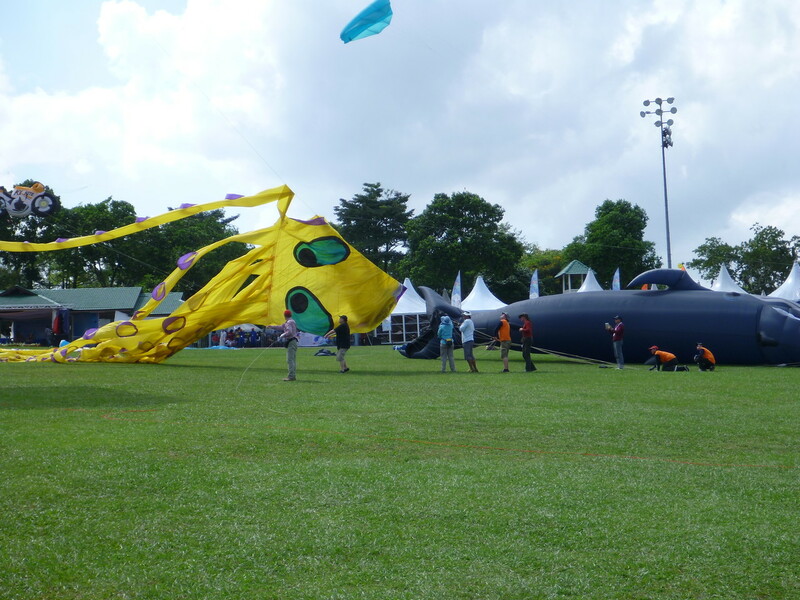 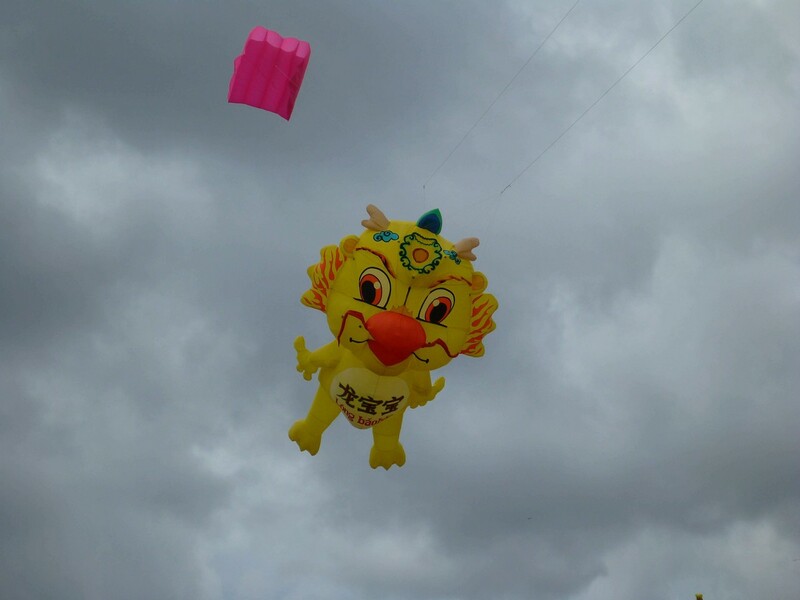 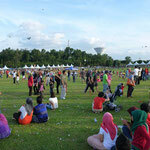 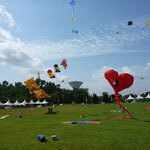 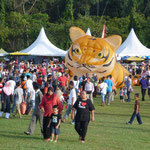 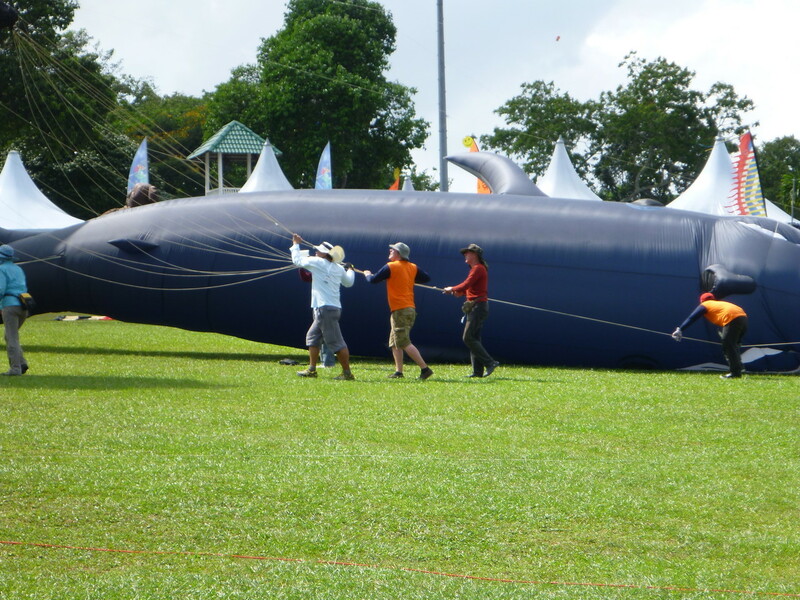 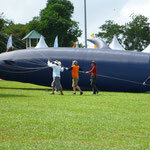 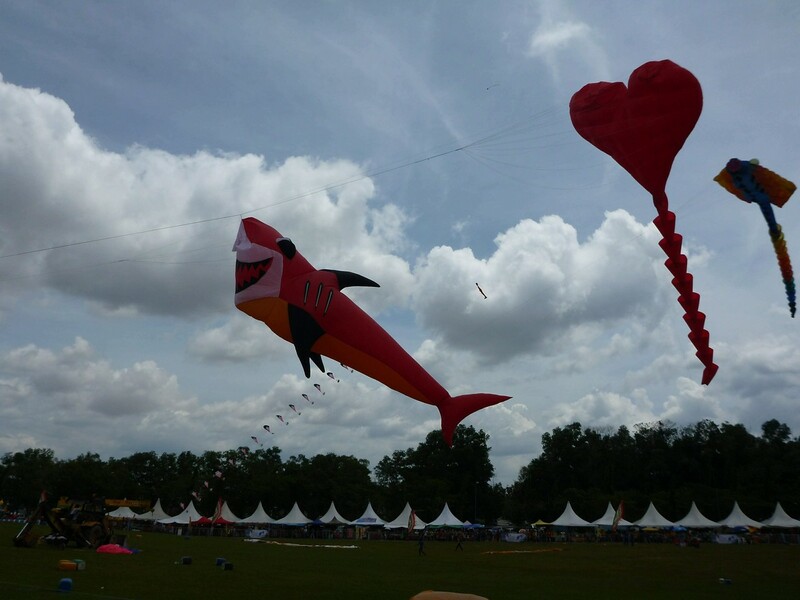 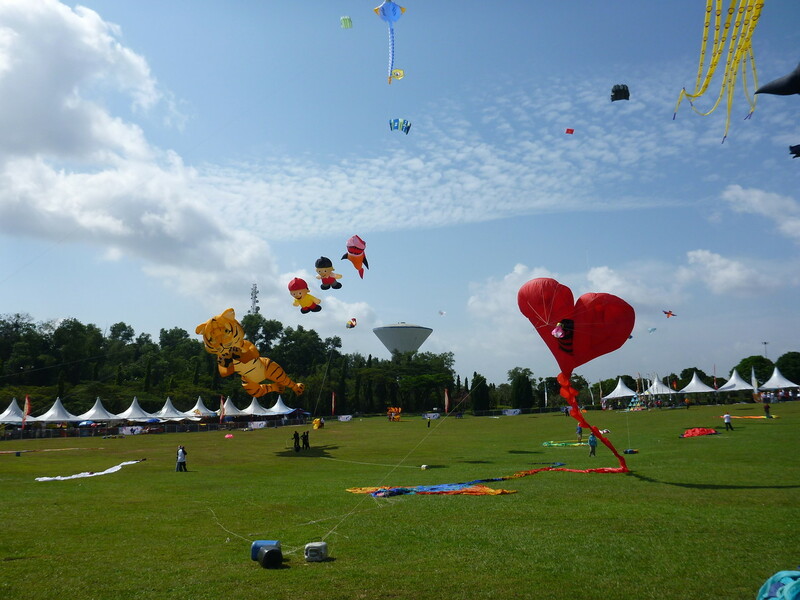 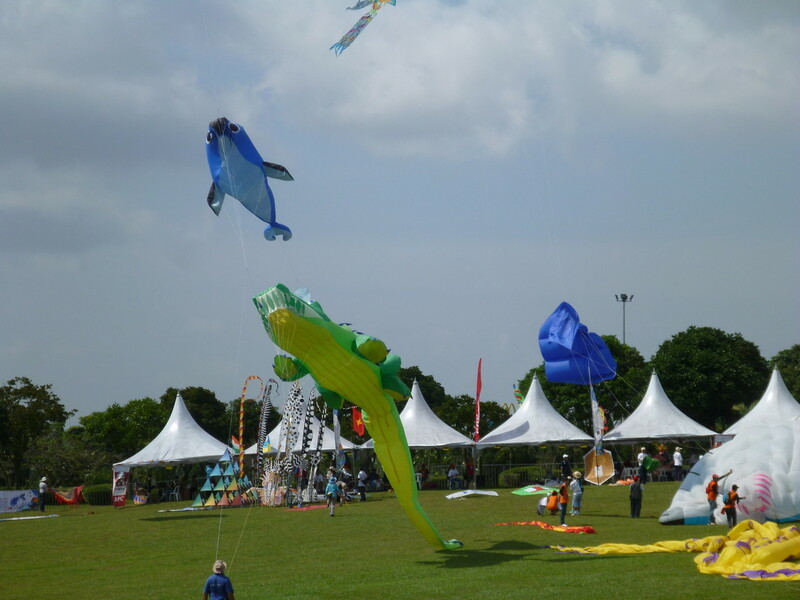 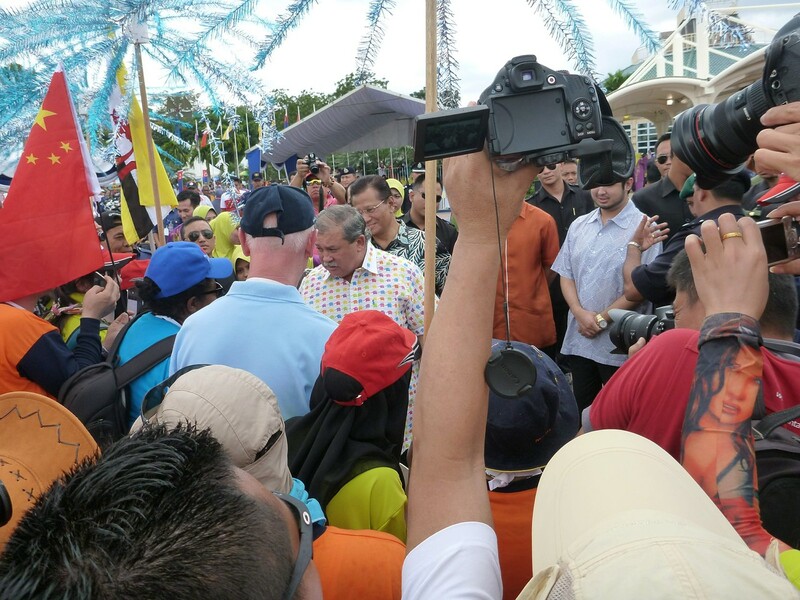 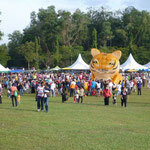 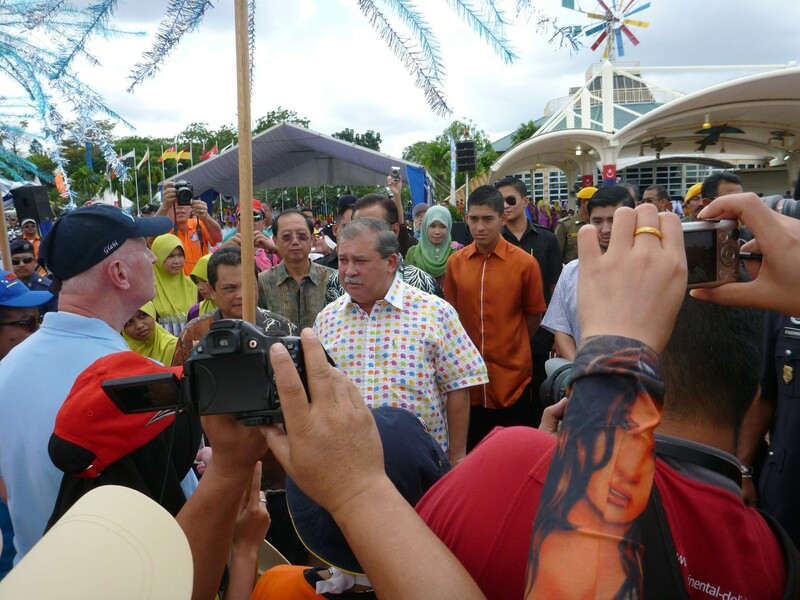 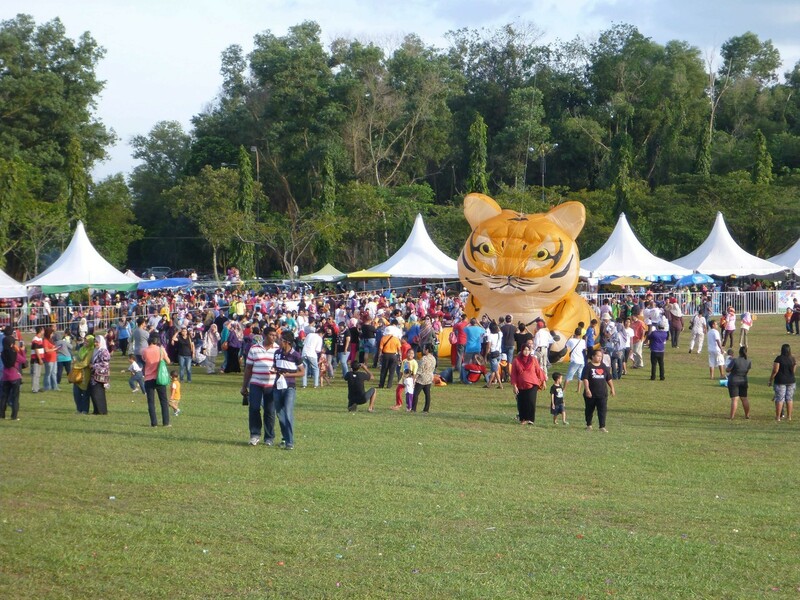 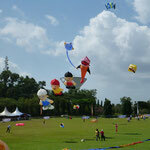 On Saturday, the Sultan of Johor gave his annual visit to the kitefestival. 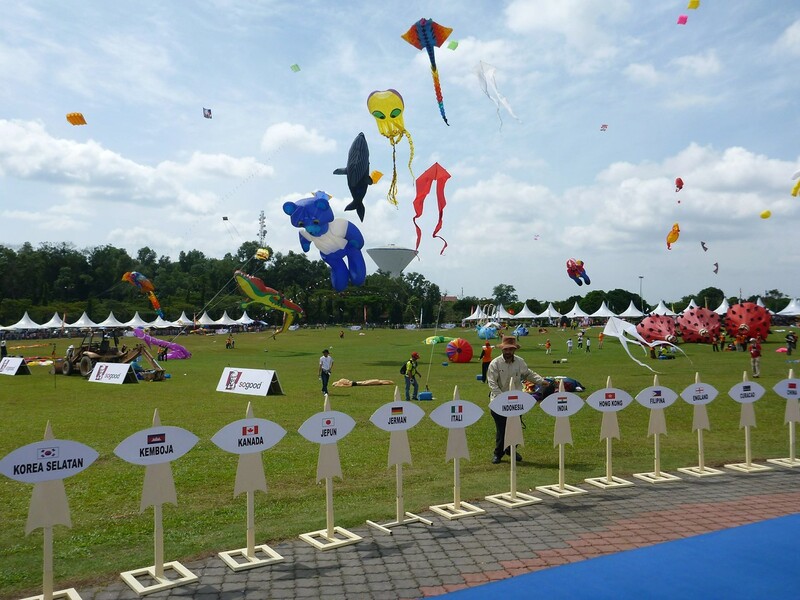 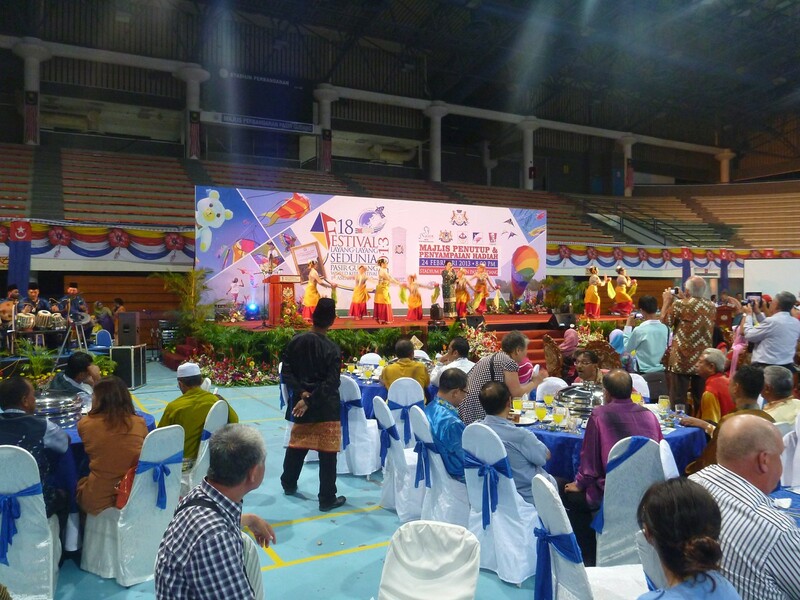 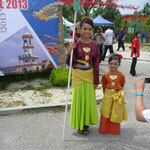 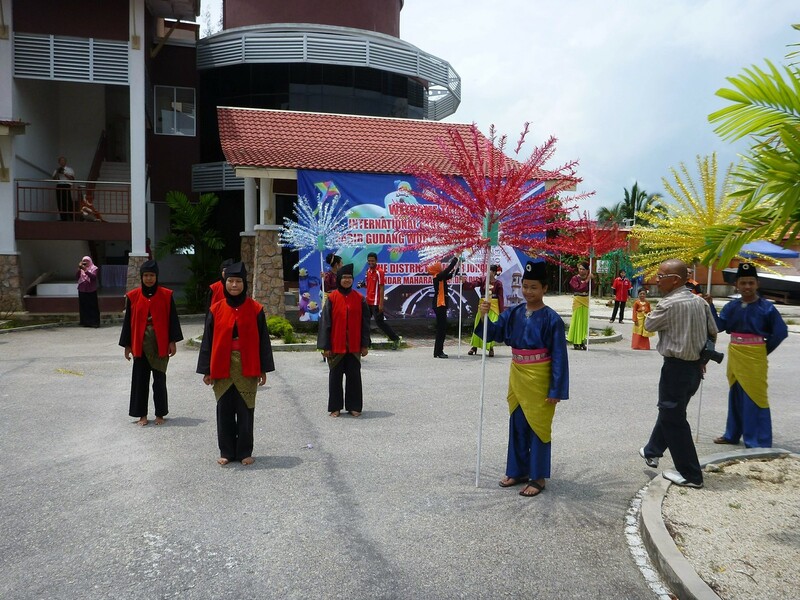 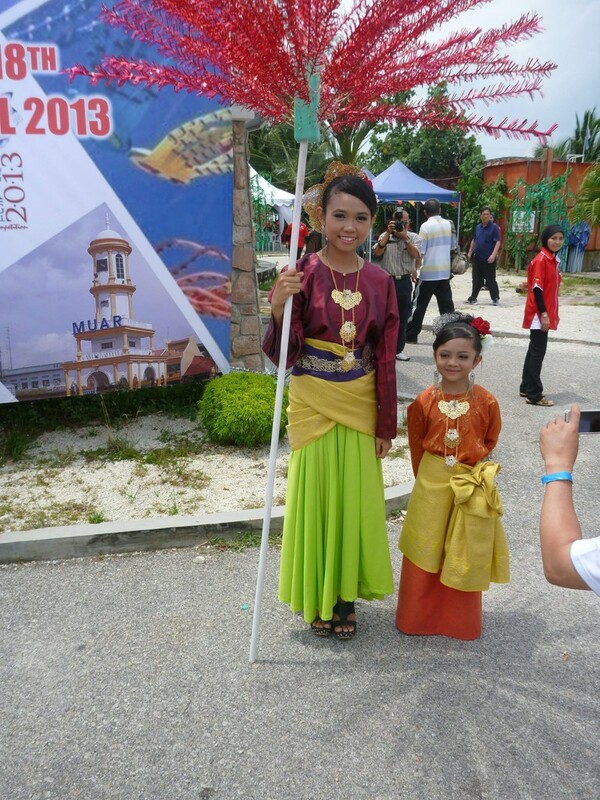 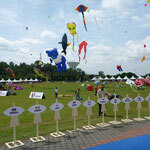 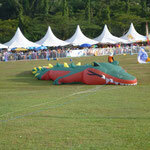 When the official part was over, we took the chance to show our kites to the Sultan of Johor. 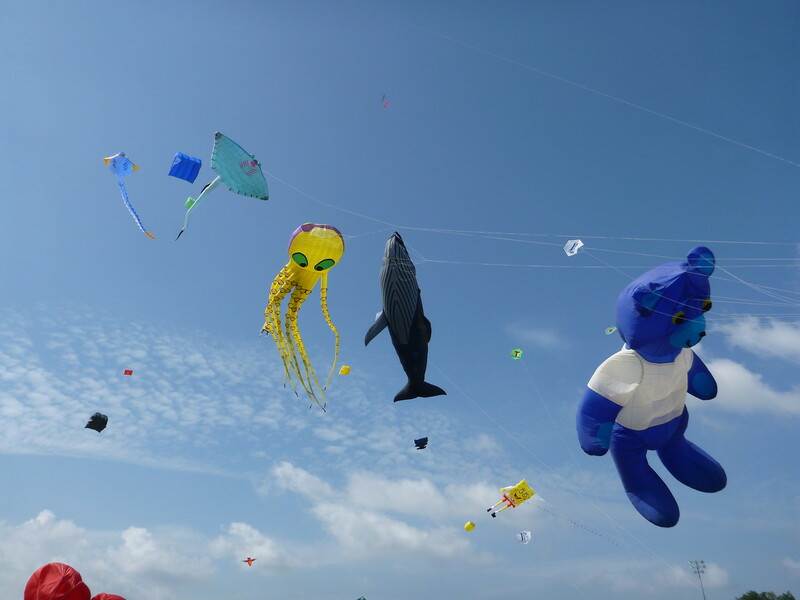 Luckily, the wind was on our side this year. 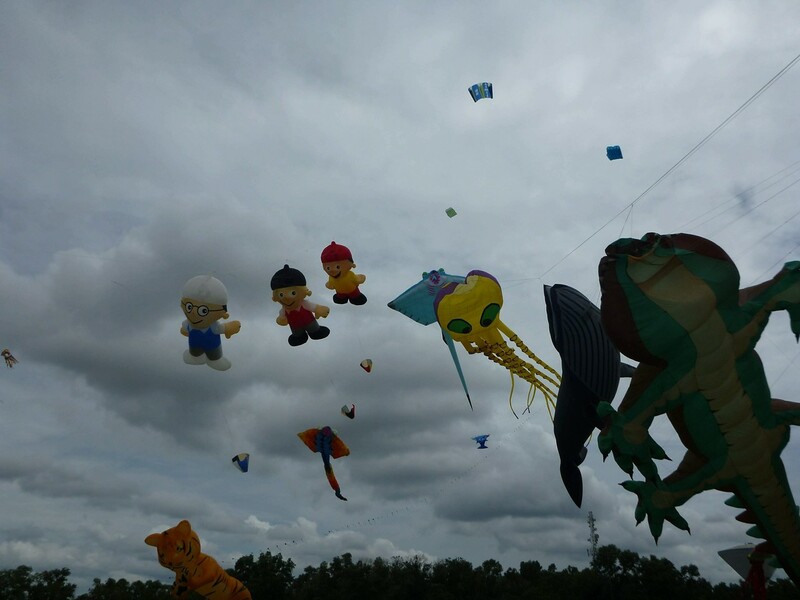 So we kept flying the kites until we had to leave for dinner. 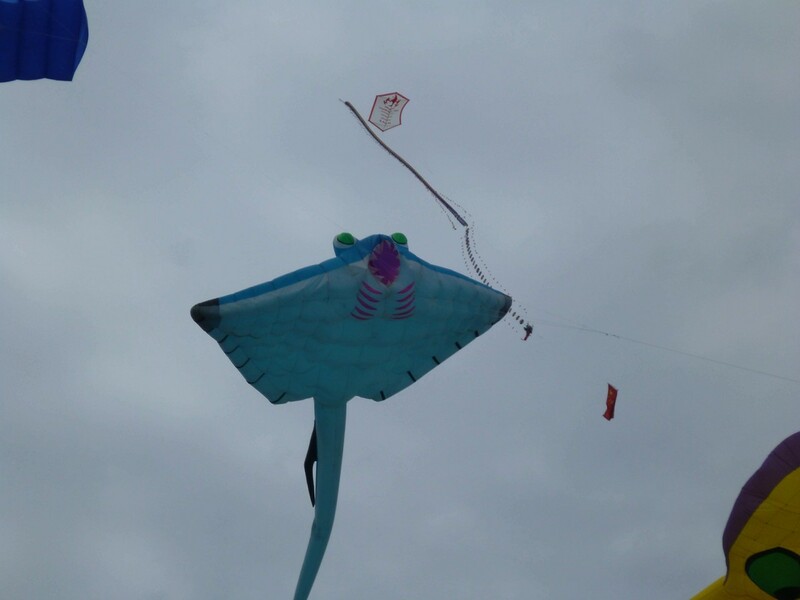 When dinner was finished, we went back to the kitefield to equip a white 8m pilot kite with LEDs and launched it in the middle of the crowd. 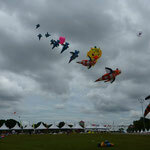 Some 10000s spectaters where in the kitefield, having picknik, listening to a live concert, and off course, enjoying kites. 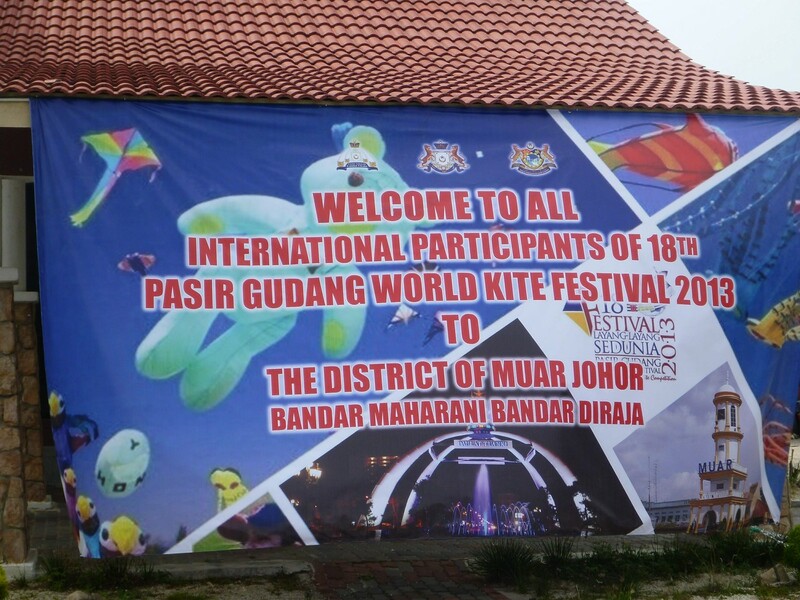 On sunday, the kitefield for the internationals was extended into the area where the national competitions took place earlier. 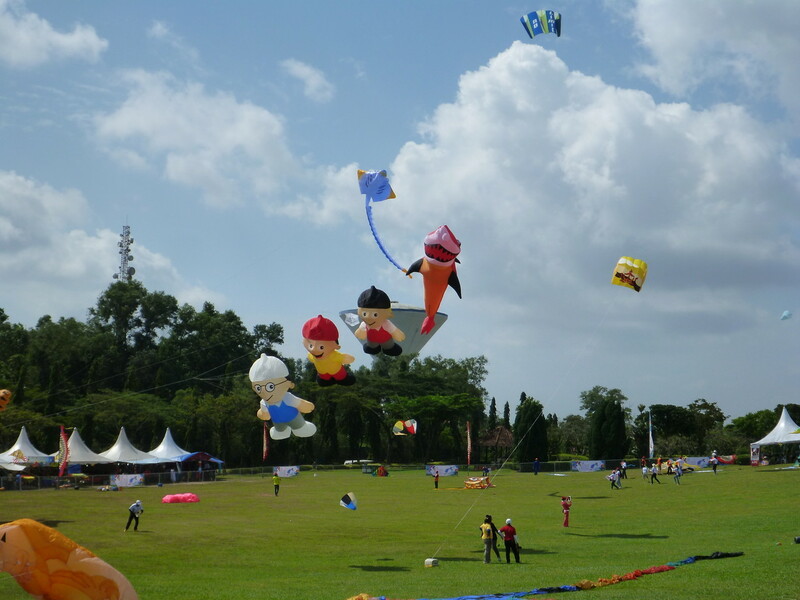 That gave us and everybody else more space to fly even more kites than the days before. 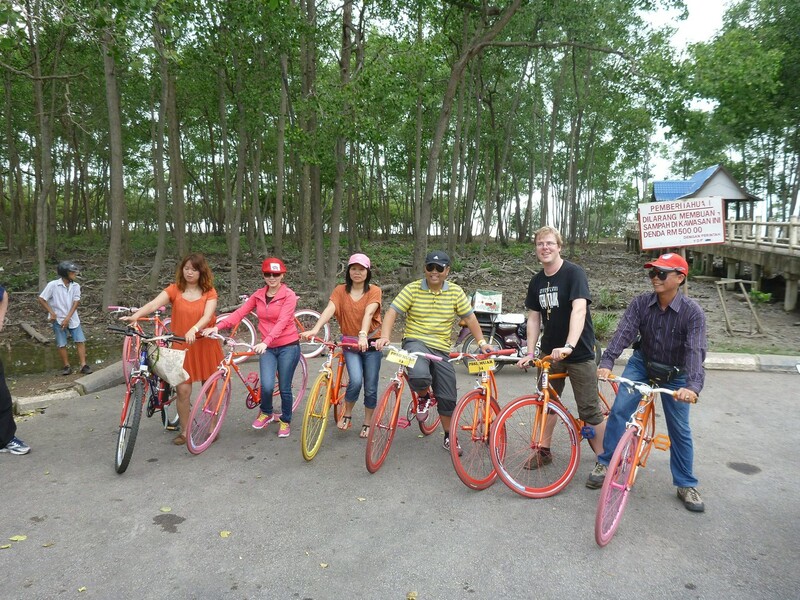 Monday 25th, the kitefliers had the opportunity to join a guided tour. 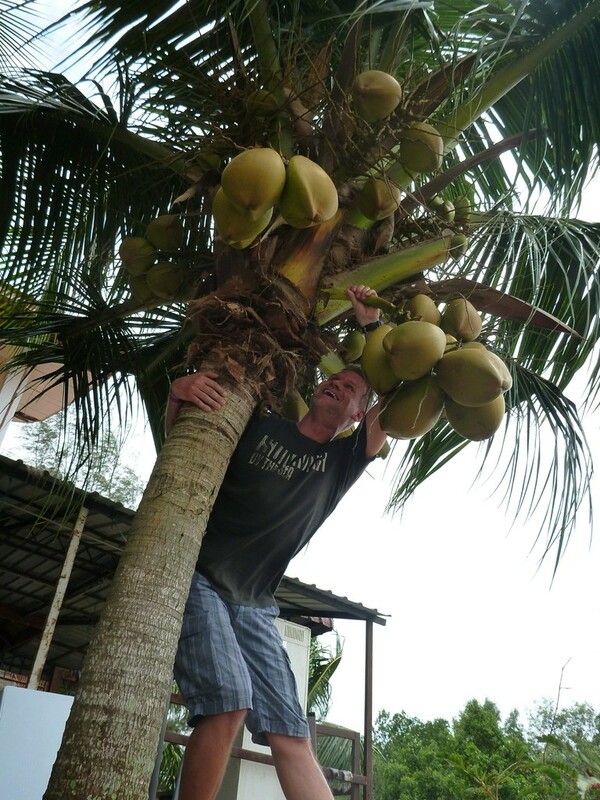 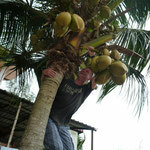 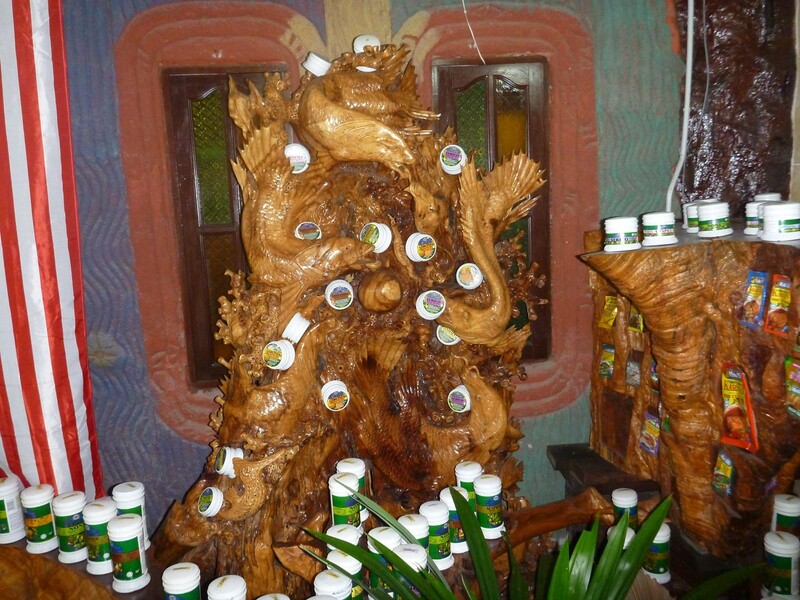 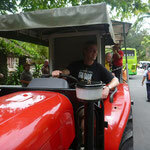 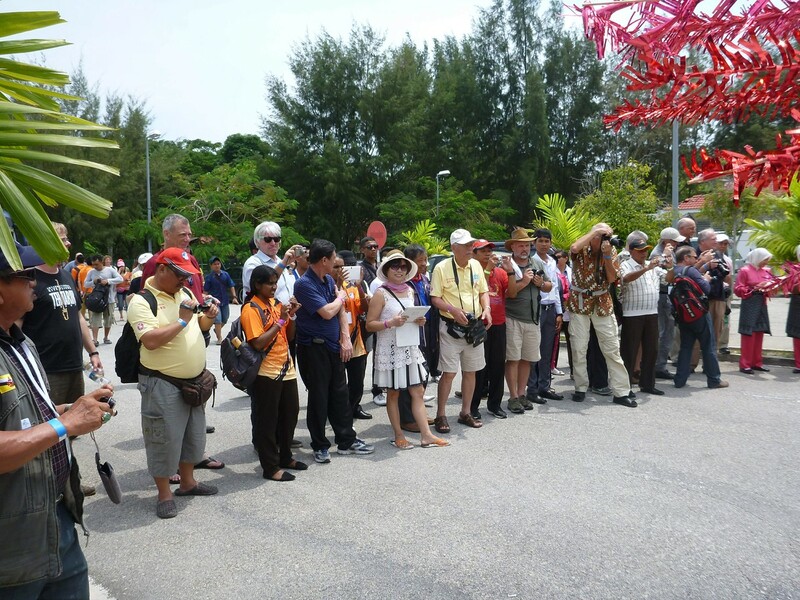 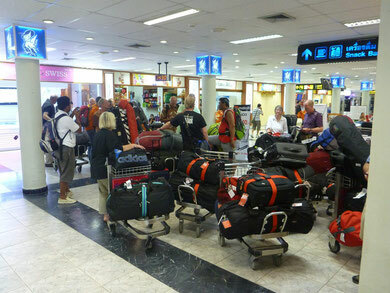 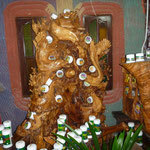 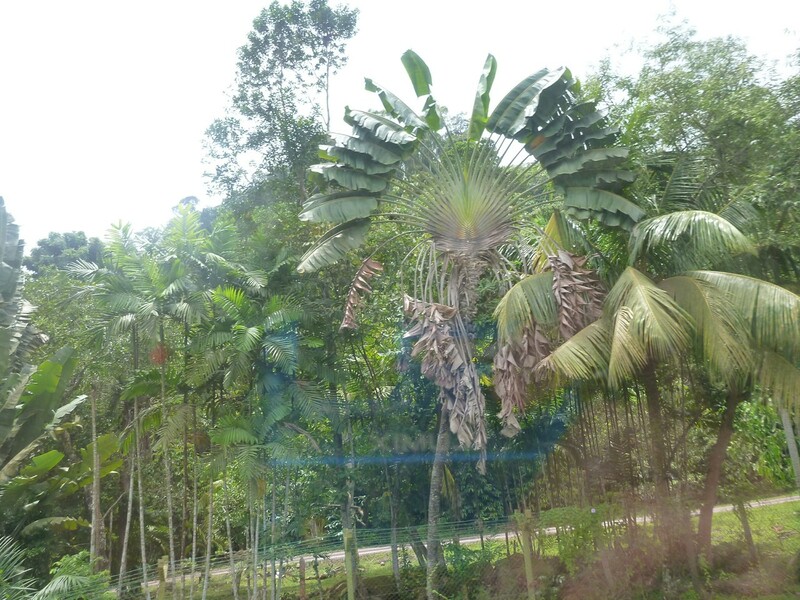 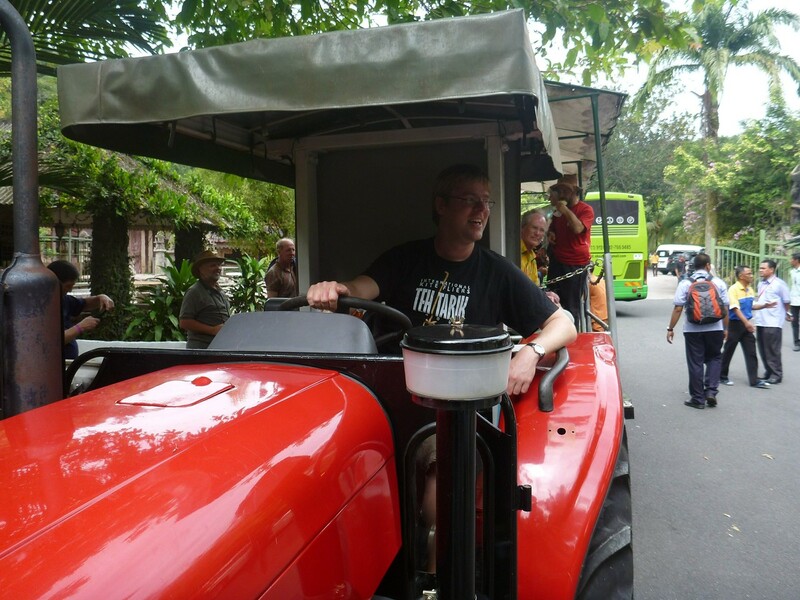 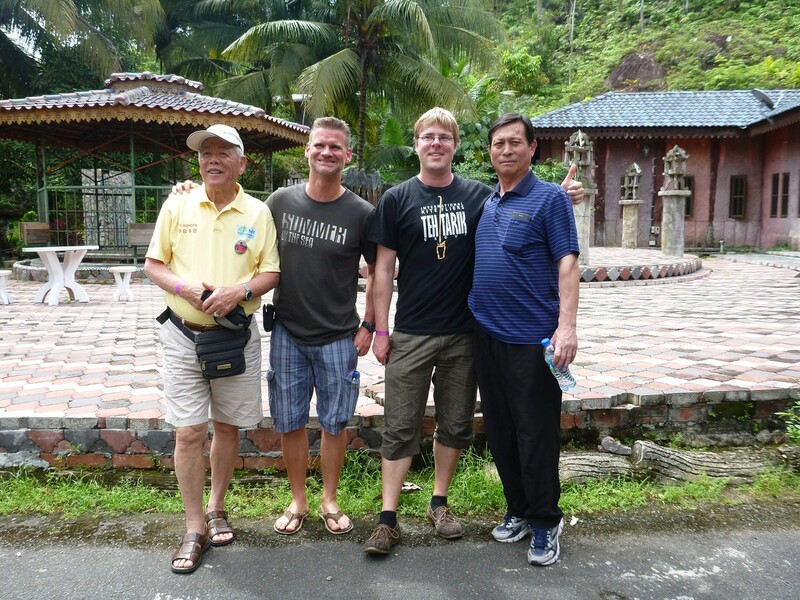 We left the hotel in 3 buses and the first stop was Nasuha Organic Natural Herbs: http://www.nasuhaherbsparadise.com/. 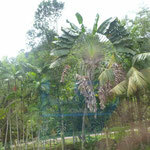 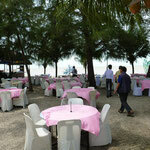 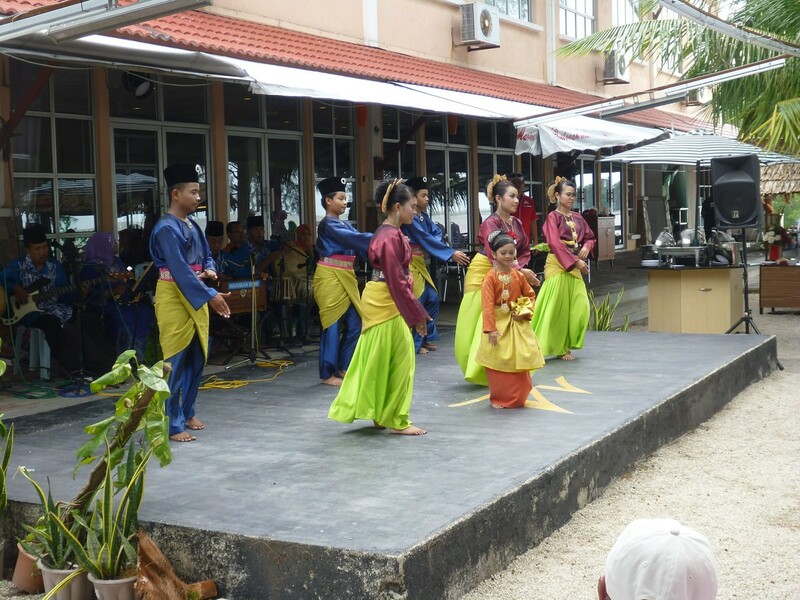 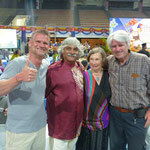 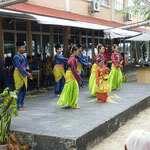 Here we had our lunch, a tea testing and a short introduction into the malay flora. 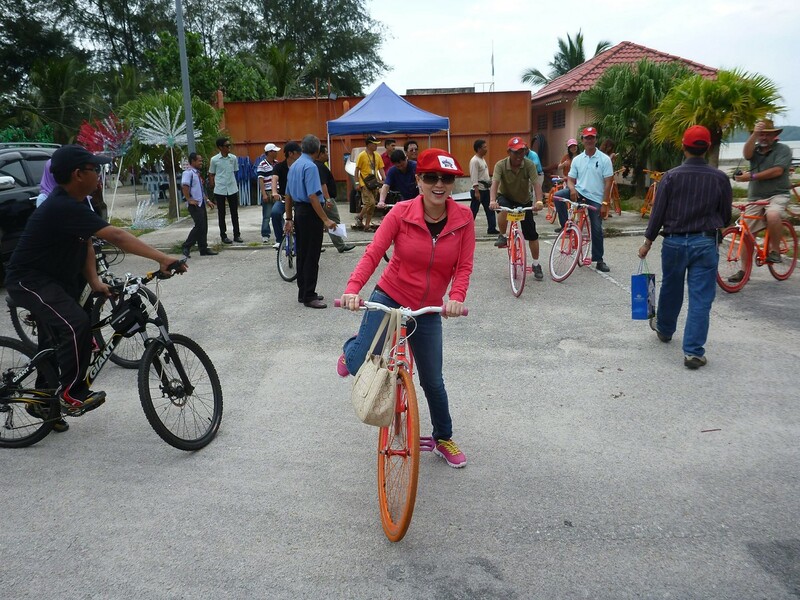 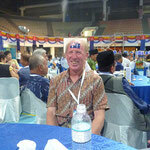 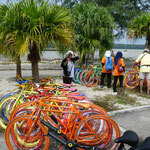 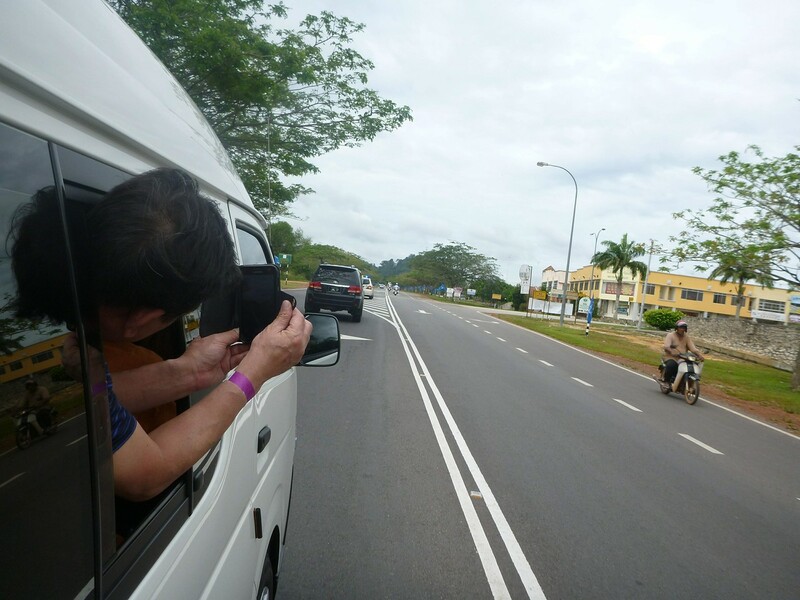 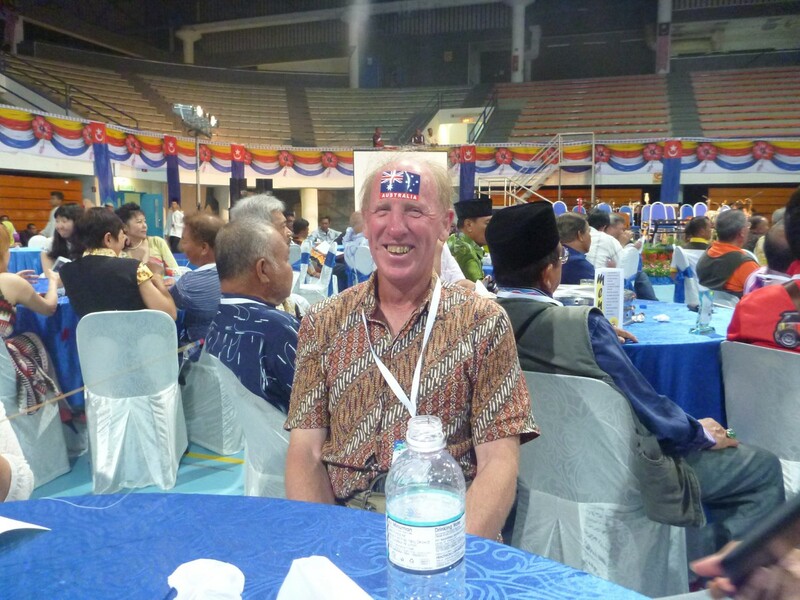 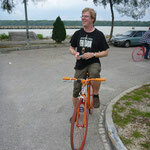 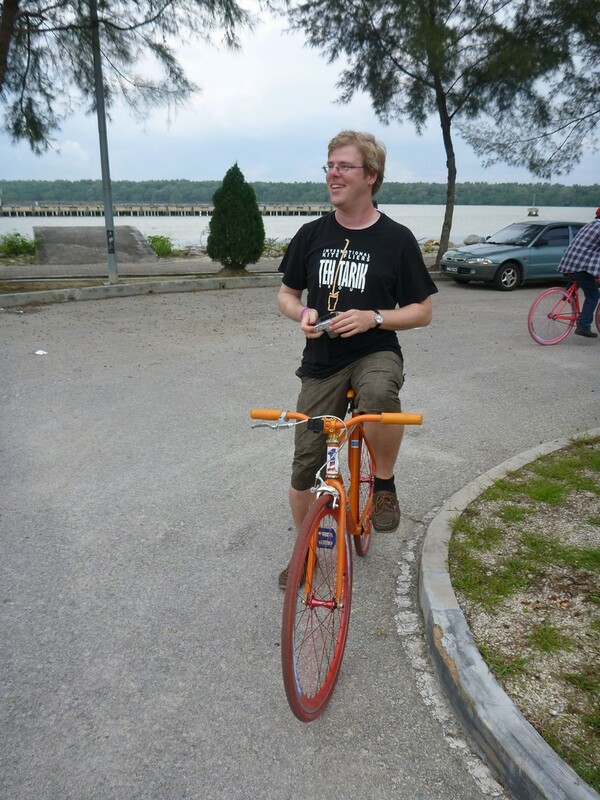 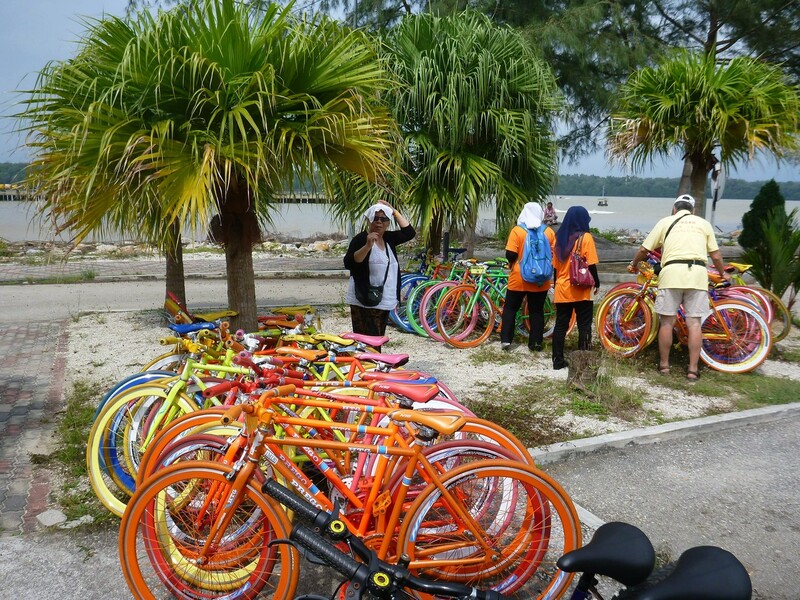 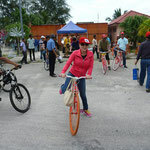 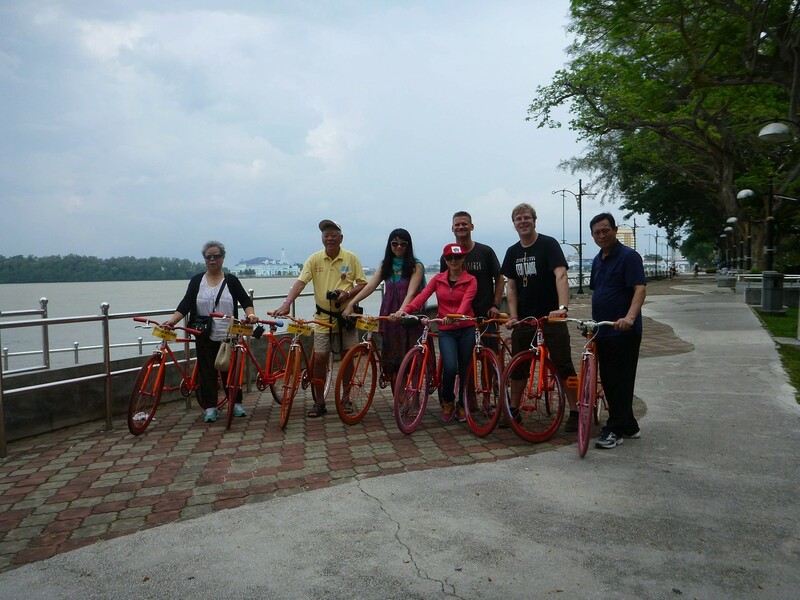 We continued to Muar where we had another lunch, prepared to have a bicycle ride on very coulourful bicycles. 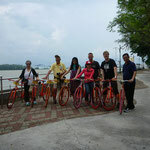 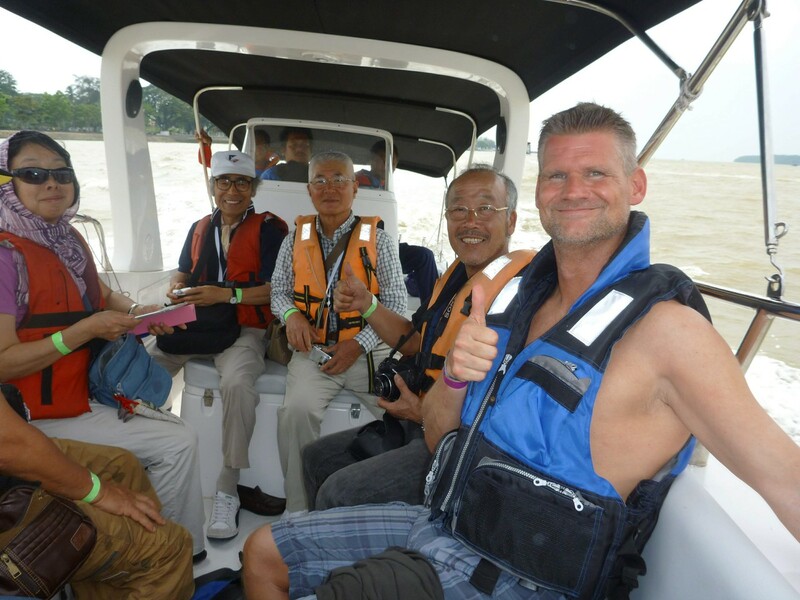 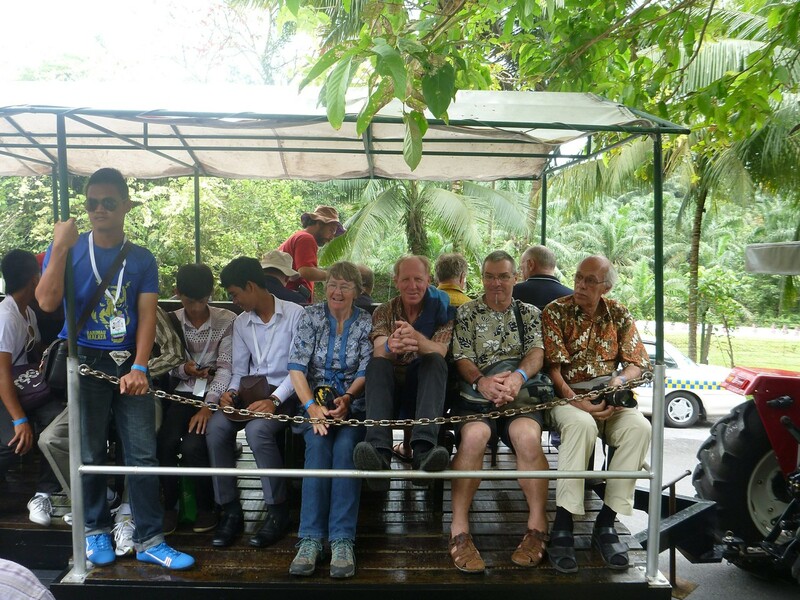 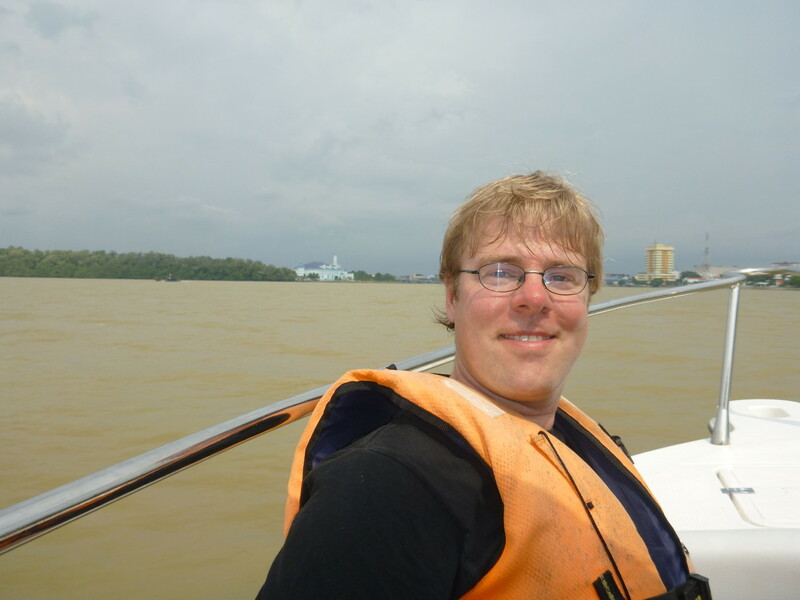 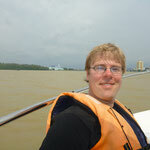 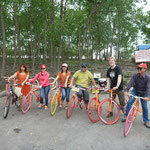 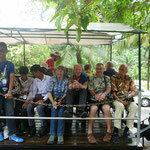 The bicycle ride was followed by a 30min boat trip on the Sungai Muar. 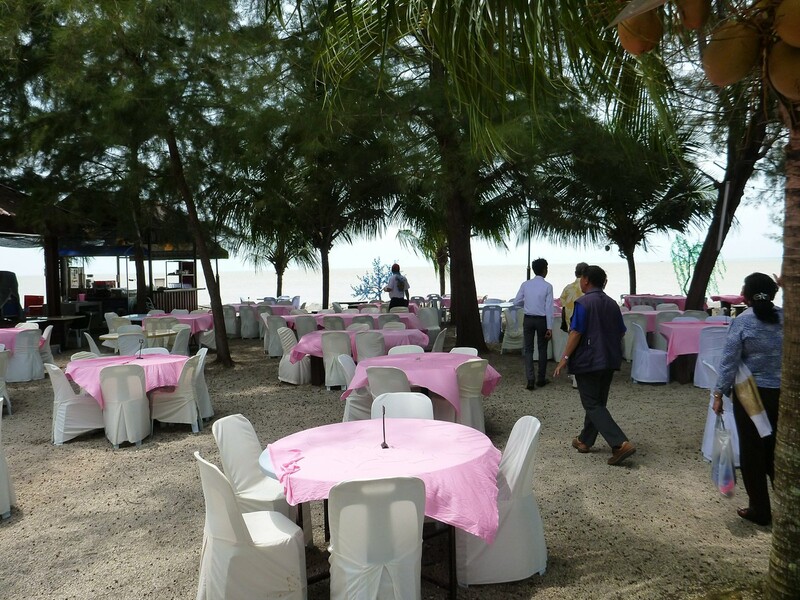 Before leaving to the hotel, we had some food, i.e. 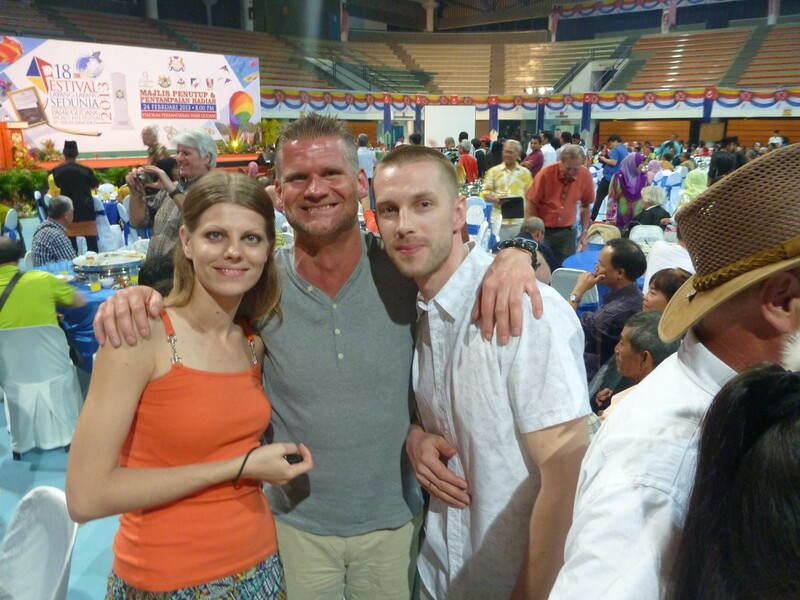 Saté BBQ with delicious peanut sauce.